Bleriots Guest House provides the perfect location for visitors that wish to have close and convenient access to Dover's ferry port. 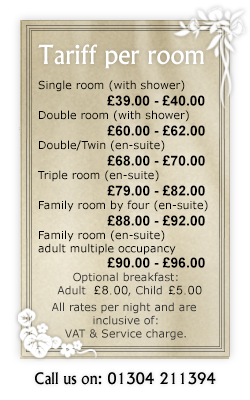 The accommodation is non-smoking and set in a Victorian Residence on a leafy tree lined avenue just over 1 mile away from Dover ferry ports. It is also very well located for visiting local restaurants and Dover Castle. The bed and breakfast has been awarded three gold stars by the AA and is highly commended for its comfort. "Thanks very much for your hospitality during our recent stay at Bleriots Guest House (25 July). The accommodation and facilities provided were just what we were looking for, and extremely convenient for access to the ferry terminal."